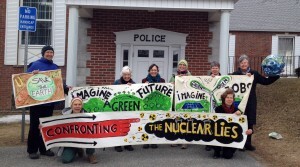 VERNON, Vermont—With signs encouraging green jobs and green energy, ten women from the Shut It Down Affinity Group held green balloons and waved as children and their parents exited Vernon Elementary School for the day on Wednesday, March 19. 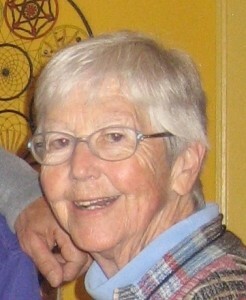 “We wanted to do something fun and positive,” said Nancy First, 84, of Northampton, one of the Shut It Downers. Many parents and children waved enthusiastically. 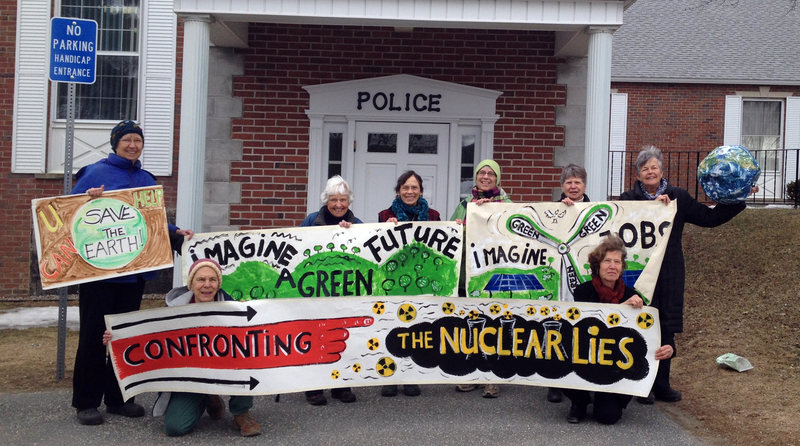 Shut It Downers also held a sign saying “Confronting the Nuclear Lies” with a finger pointing in the direction of the Vermont Yankee power plant less than a mile away. 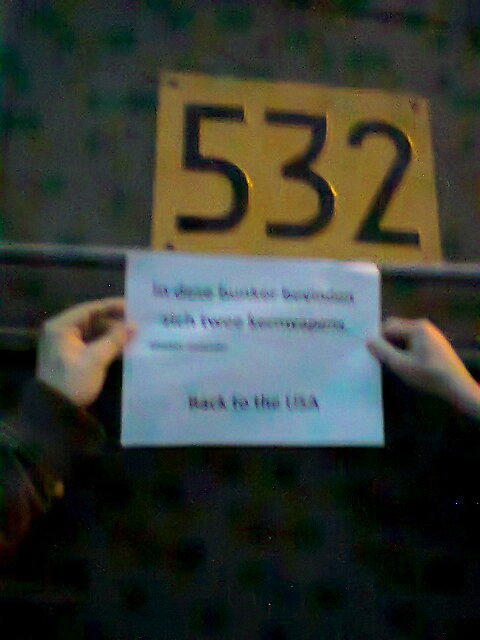 To draw attention to a significant lack of nuclear security in our little country, this week four Dutch activists entered the secured zone of Volkel Airbase and managed to take a picture of one of the SW3 bunkers in which American B61 nuclear bombs are kept. The activists were arrested and remain detained. 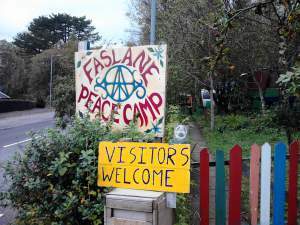 Two campaigners from Faslane Peace Camp were arrested on Wednesday morning, March 19 aboard the Royal Navy submarine HMS Ambush at its berth in Faslane. Security at the site – home to Britain’s Trident nuclear weapons and headquarters of the Royal Navy – was again called into question by the protestors’ actions. On Tuesday, March 18 at 5:50 a.m., 60 Greenpeace activists from France, Germany, Belgium, Italy and Poland staged an occupation of the Fessenheim nuclear power plant, France’s oldest nuclear power station. They criticized the risk that French nuclear power poses to the whole of Europe, and called on the French government, which has programmed the closure of the Alsatian power station, to bring about a real change in energy policy in France. 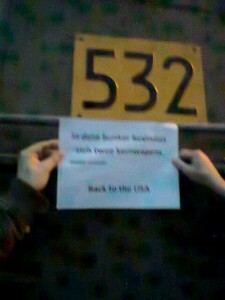 Some activists first displayed a banner at the side of Reactor 1, while others climbed up the side of the reactor pool of Reactor 1 and onto the reactor dome. Once there, the activists unfurled a banner which was 200 metres square and read, “Stop risking Europe”. They stayed in place holding this banner for four hours. Twenty of the activists were arrested. Seven people walked up to the gate of the 132nd Air National Guard Base in Des Moines, Iowa on Monday, March 17, carrying photos of some Afghan Peace Volunteers and victims of drone strikes. The group attempted to deliver a war crimes indictment. Julie Brown, Ruthie Cole, Chet Guinn, Elliot Adams, Michelle Naar-Obed, Steve Clemens and Eddie Bloomer were arrested and charged with criminal trespass. The nonviolent action took place on the last day of the Midwest Catholic Worker Faith and Resistance retreat. The tears were streaming down my cheeks as I walked towards the shuttered iron gates in front of the Iowa National Guard base in Des Moines. 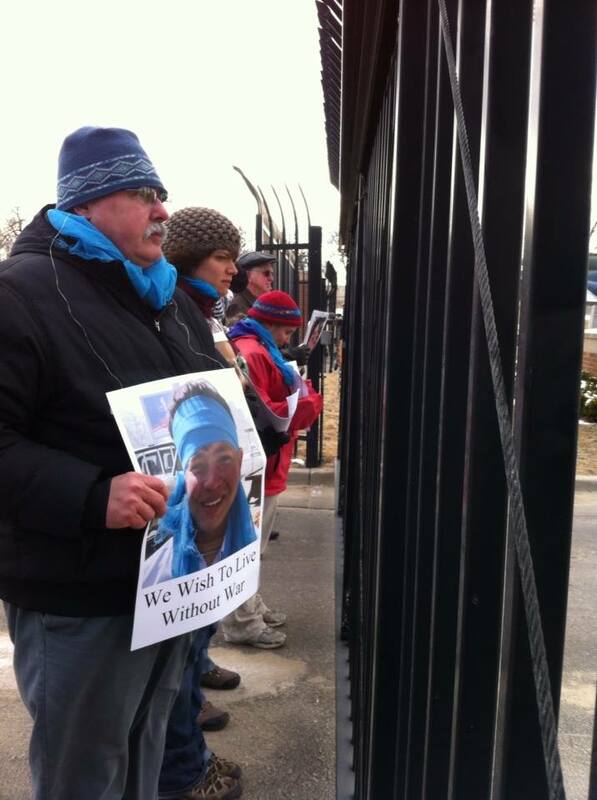 The tears were a combination of reaction to the cold wind in our faces as seven of us walked slowly and deliberately toward the base entrance as well as my emotions remembering the victims at the receiving end of military drones. 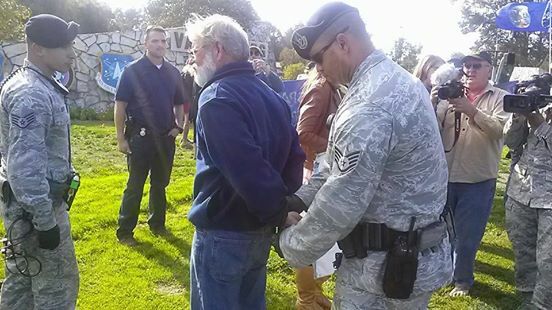 Activists from around the world held a Friday afternoon vigil [on March 14] at Vandenberg Air Force Base to oppose military programs and show solidarity with local protesters, two of whom again were arrested for trespassing. Approximately 30 people attended the hour-long vigil which launched this weekend’s 22nd annual space organizing conference in Santa Barbara. The conference involves the Global Network Against Weapons & Nuclear Power in Space, made up of 150 peace and religious groups opposed to what they say is the development of a new arms race in space.